The NFPA Certified Emergency Power Systems Specialist (CEPSS-HC) for Health Care Facility Managers credential was developed in response to the U.S. Centers for Medicare & Medicaid Services (CMS) 2016 ruling that states that 17 of the provider types must establish comprehensive emergency preparedness plans. A component of this ruling requires these facilities to evaluate their emergency and standby power systems. In light of this, NFPA has developed this certification for facility managers to be able to demonstrate that they have the knowledge to keep their facility in compliance with the CMS ruling and with emergency power provisions found in the 2012 edition of NFPA 99, Health Care Facilities Code, as well as the 2010 editions of NFPA 110, Standard for Emergency and Standby Power Systems, and NFPA 111, Standard on Stored Electrical Energy Emergency and Standby Power Systems. The exam is based on the 2012 edition of NFPA 99, Health Care Facilities Code, and the 2010 editions of NFPA 110, Standard for Emergency and Standby Power Systems, and NFPA 111, Standard on Stored Electrical Energy Emergency and Standby Power Systems. It is the candidate’s responsibility to obtain these reference sources for study purposes and to have present during the examination. They are the only reference sources allowed in the examination room. If you would like to purchase these NFPA documents, please go to NFPA's online catalog. 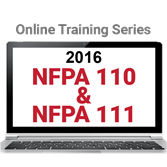 This online training series addresses how to implement provisions in NFPA 110: Standard for Emergency and Standby Power Systems and NFPA 111: Standard on Stored Electrical Energy Emergency and Standby Power Systems. 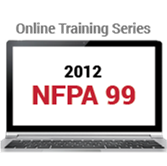 Get the NFPA 99 training you need in your own time frame with the interactive NFPA 99 Online Training Series.